Bring a large pot of salted water to a boil. Add potatoes and cook until tender but still firm, about 10 to 15 minutes (depending on the size of the potatoes). Drain and set aside to steam dry until cool. 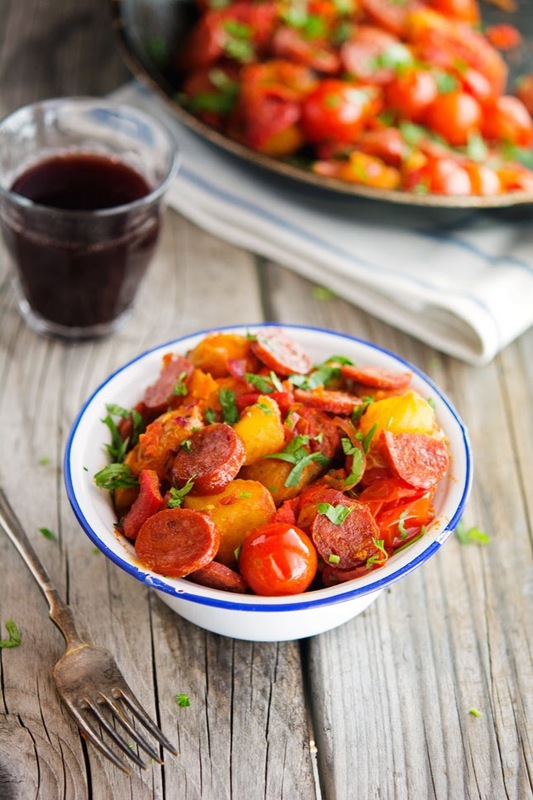 Heat a large pan over medium heat, add the chorizo and cook, stirring frequently for 4 to 5 minutes or until crispy. 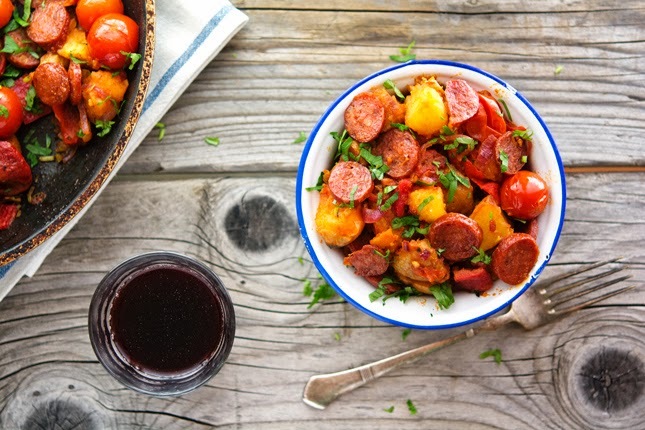 Use a slotted spoon to remove chorizo from the pan and set aside. Add olive oil (only if necessary though, the chorizo releases a lot of its oil), once hot, add onion, paprika and parsley stalks. Cook for 5 minutes, or until the onion is soft but not colored. Add cherry tomatoes (without the juice), roasted red bell peppers, apple cider vinegar and a good pinch of salt and pepper. Bring to a boil, then turn the heat down and simmer for 15 minutes or until the sauce starts to thicken. While the sauce simmers, put a large frying pan over medium heat and add olive oil. Halve or quarter potatoes, as necessary to make similar-sized pieces. Once the oil is hot, carefully add your potatoes and cook for about 8 minutes, turning occasionally until golden brown. Add garlic and rosemary to the pan for the last minute of cooking. Transfer potatoes, garlic and rosemary to plate lined with paper towels to drain, then scatter over with paprika and salt and toss until well coated. Add potatoes to the sauce and carefully mix until combined. 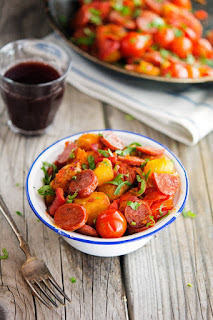 Transfer to a plate, top with fried chorizo, sprinkle with fresh chopped parsley and serve.